Anadarko Has Been Trading At A 52-Week Low. Where Will It Head Going Into 2019? How Is Anadarko Petroleum Corp Likely To Grow In The Next 2 Years? Is Anadarko Petroleum Corp Fairly Valued? How Will Anadarko Perform In 2019? 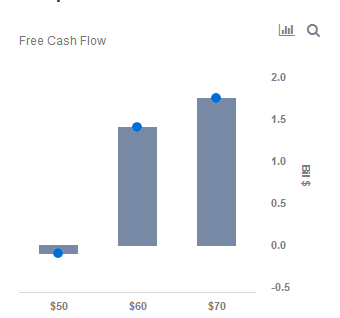 Anadarko Petroleum’s (NYSE: APC) outlook for 2019 looks increasingly promising, with consistent positive cash flow stabilizing operations. With the price of oil expected to remain stable, we expect Anadarko to do quite well in 2019, this continuing on from its performance in 2018. We currently have a price estimate of $63 per share for Anadarko Petroleum, which is higher than its market price. View our interactive dashboard – Anadarko – 2019 – and modify the key drivers to visualize the impact on its valuation. We expect revenue to come in between $13-13.5 billion, depending upon on the price of oil. We expect average realized price of oil to be $60 in 2019. Anadarko has projected break-even above $50 per barrel. We further project that Anadarko will produce an FCF of $1.4 billion at $60. 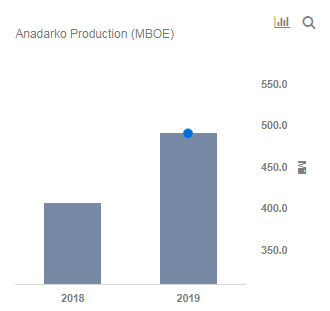 Anadarko was producing at the end of 2018: 407 MBOE/d. We expect Anadarko to increase production by up to 20% yoy, in 2019. Oil Assets: The following is an overview of Anadarko’s assets. The DJ basin, and the Delaware Basin are responsible for the majority of Anadarko’s U.S onshore oil production. Producing a total of 189 MBOPD. The Gulf of Mexico produces 142,000 BOE/d. We expect that Anadarko will continue to ramp up its production in the Gulf of Mexico, with volumes increasing anywhere from 15-20% for the year. With the Gulf of Mexico reserves expected to break-even lower than that of its US onshore reserves, volumes from this area could be significant in shoring up the company’s cash flow. Mozambique will be a key source of gas production for the company. With production reaching 7.5 million tons per annum, we expect that Anadarko will increase its volumes to 9.5 MTPA in 2019. With the realized price for gas sales being anywhere between $6-6.50 mcfg. Anadarko’s mix of upstream and downstream operations have ensured that it remains relatively steady through times when oil prices are low. Furthermore, the company expects its oil break-even price to continuously fall throughout 2019, and onward. Also, the company is expected to reduce its debt throughout the year, and this should help the bottom line going forward. In conclusion, we expect Anadarko’s EPS to see significant improvement in 2019, as long as oil prices remain relatively steady. 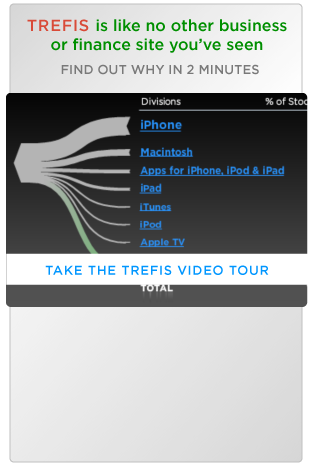 We believe that the company will continue to be profitable and this should reflect in the stock price going forward.